Kim Sherwood, co-owner of ACT Campground and Learning Center, holds a bachelor’s degree in biology, a master’s in botany, and a master’s in engineering. As an environmental engineer, he has wide knowledge of geology. A natural-born teacher, Kim puts on small workshops on scientific subjects and will be leading botany and geology tours in the Moab area. 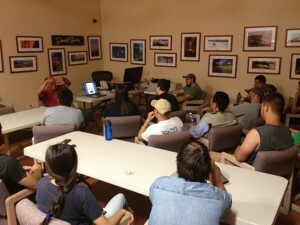 Kim Sherwood puts on a PowerPoint presentation on area geology for a group of students from Fort Hays State University, Hays, KS. The Learning Center at ACT Campground is ideal for small group seminars and workshops, as well as serving as a dining area for guests using the community kitchen. Here’s a picture of a recent university group in the Learning Center, enjoying one of Kim’s informative PowerPoint presentations.